You want a camera with imaging power—something that offers a reasonably sized sensor, an advanced processor, a megapixel count that lets you do more than upload to Facebook and Twitter, a flexible instrument that lets you swap out lenses to suit a variety of shooting situations, and something with perhaps a bit of heft for better stability and ease of use. What you’re looking for is either a DSLR or one of the many compact interchangeable-lens cameras that have grown in popularity over the last couple of years. These are not pocketable point-and-shoot or smartphone analogs. These are sophisticated photographic devices that help you produce the images you envision. We’ve looked at a number of these cameras this year, and offer up our favorites here. This camera is for serious photographers—advanced hobbyists and photo pros. 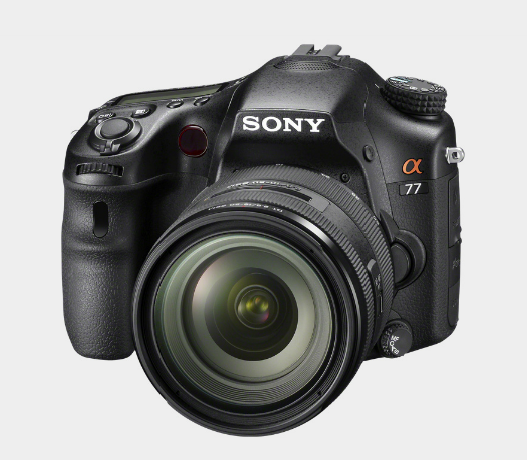 The $1300 SLT- A77 followed on the heels of Sony's groundbreaking 2010 models, the SLT-A55 and SLT-A33. With all of these models, Sony created a new category of camera—models that are similar to a conventional DSLR (same sensor size, lens mounts, and general form factor) but distinguishable by the way they use the internal mirror. The SLT-A77 is a 24-megapixel camera that shoots 12 frames per second—a workhorse that serves up an arsenal of high-tech features such as a new 19-point autofocus sensor and in-camera GPS. Despite its serious specs, the SLT-A77 is also fun to shoot with. Some photographers crave a compact and capable second camera. Others seek advanced image quality without the bulk and heft of a DSLR. If you fall into one of those categories—or anywhere in between—check out the $549 Olympus Pen E-P3. It's the third entry in the company’s Pen series, and it easily assumes the top position in the company's Micro Four Thirds line, which includes the E-PL3 and the E-PM1. Improvements include a new Live MOS sensor and a 3-inch OLED semi-touchscreen. This model also features faster performance, full HD video, built-in flash, and a maximum native ISO setting of 12800. Another choice for those seeking DSLR capabilities in a compact package is Panasonic’s $700 Lumix DMC-G3. This model is designed to combine the benefits of a DSLR-style interchangeable-lens camera with a small footprint, light weight, and ease of use. Its diminunitive size and weight are the result of advancements in mirrorless viewfinder technology, and large DSLR format sensors that are compatible with newer compact Micro Four Thirds system lenses. With 16 megapixels, this camera has full manual, semimanual, and automatic exposure modes, as well as many advanced features such as a touchscreen interface. Custom options, a quick menu, and dual-function buttons create a smooth and convenient shooting workflow. Photographers seeking a more basic approach have a host of automatic features to choose from. Full-frame DSLRs needn't be hefty. Nikon offers the $2100 D600 as a small, light, affordable full-frame camera targeted at photography enthusiasts. The body, which is built around a magnesium-alloy chassis, weighs just 26.8 ounces. In addition to an eye-level optical viewfinder, there's a 3.2-inch, 921,000-dot fixed LCD viewfinder on the back. The 24-megapixel camera features a 39-point contrast-detection autofocus system, an ISO range of 50 to 25,600, and a continuous-shooting rate of 5.5 frames per second at full resolution. In addition, it has an on-board hot-shoe and a pop-up flash, the last of which can also be used as a commander flash for external Nikon Speedlight flashes. Battery life is rated at 900 shots per charge. Serious and fun at the same time. That's the new Olympus OM-D E-M5 ($1200), a model that's designed to emulate the look and feel of the traditional OM line of 35mm film SLRs. While topping the charts for image quality compared to other Micro Four Thirds cameras, we were also impressed with the 16-megapixel camera's superior exposure, color, sharpness, and lack of distortion. JPEGs look terrific with default settings. But there are also plenty of imaging goodies, such as a multiple-exposure capability, an array of scene modes including 3D capture, and art filters that allow you to preview the effect on the LCD or in the electronic viewfinder before you shoot, all bundled within a weather-sealed body. Still-shot adverturers who take their cameras along for everything from snorkeling in Australia to snowshoeing in Siberia can depend on the Pentax K-30 ($850). This affordable, versatile, midlevel DSLR has a weather-sealed polycarbonate body that stands up to cold and wet conditions. The 16-megapixel Pentax K-30 is an excellent DSLR choice for traveling photographers and creative types who will no doubt appreciate its 100 percent, accurate, optical field of view and in-camera effects, including HDR and multiple exposure. For most outdoor shooting, the 18-135mm zoom provides plenty of width and reach, without adding much weight. Plus, if you need to, you can plug in AA batteries. If video is a big part of your shooting repetoire, however, other cameras may serve that purpose better. Canon's line of entry-level DSLR Rebels got a boost with the T4i ($600 to $900) a full-frame DSLR designed to span a range of hobbyist photographic expertise. The camera's 18-megapixel resolution, with an APS-C CMOS sensor and the latest Digic 5 image processor, offers swift operation and excellent low-light performance regardless of the shooter's skill. The hybrid sensor (phase-detection autofocus) and smartphone-like multi-touch LCD, coupled with continuous autofocus in movie mode and a built-in stereo microphone—are a few reasons why this camera is popular with a general crowd of photo enthusiasts. It's also the first Rebel model to feature an articulating touch screen 3-inch LCD monitor. The Nikon D5100 is a solid option for advanced amateur photographers seeking a highly capable, user-friendly sub-$1000 DSLR. The 16-megapixel D5100 offers an extensive feature set with an accessible interface and image quality that equals or exceeds that of the competition. Notable features include full 1080p high-definition video, a bigger and better articulating LCD screen, a larger burst-mode capacity, expanded ISO, full-time autofocus in video and Live View, and special effects for still and video capture. HD video options include 1920 by 1080 resolution at 30 frames per second or 24 fps, with two quality settings (high and normal) for each. Sony is positioning the NEX-6, with a $1000 kit price, as an alternative to an entry-level to midrange DSLR for photo enthusiasts. The NEX-6 has a 16-megapixel APS-C sensor, as well as 1080p video recording at 60 fps and ISO settings that reach up to 25600. The NEX-6 is also the first NEX camera to feature Sony's Quick Navi interactive control panel and an ISO-standard hot-shoe. It's paired with a 16-50mm f/3.5-to-f/5.6 retractable power zoom lens. The NEX-6 is one of Sony's first interchangeable-lens cameras with the ability to run Sony's camera-specific apps. The NEX-6 can connect to Wi-Fi access points for downloading apps and uploading and sharing photos, but the camera also has a few mobile apps that allow a user to control it from a smartphone or tablet and offload images to those devices. The latest addition to Nikon’s expansive DSLR line, the 16-megapixel D5100 fits neatly between the entry-level D3100 and the more sophisticated D7000.